Always feel free to contact me at the Meridian Acupuncture Clinic regarding any queries or questions you may have regarding your health and wellbeing. All questions are confidential. Drop down to the clinic. If you are out our way you’re always welcome to stop by and have an informal chat and a soothing cup of green tea. I’d be delighted to see you. Make an appointment for a FREE consultation. Yes, that’s right, I don’t charge to answer any questions you may have about Acupuncture, TCM or your health. It is part of my mission to provide you with helpful and effective answers that will have a real and lasting impact on your health. That may or may not be through Acupuncture or Traditional Chinese Medicine depending on the condition, either way you’ll receive and honest and helpful answer to your questions. You can also use this form to ask any questions you may have and receive a discreet, private and prompt reply. My private clinic is located at the Red Door, 175a Lower Kimmage Road, Dublin 6w. Map Please click on any of the route numbers to be taken directly to the Dublin Bus Timetables for each route. These will open in a new window so you won’t lose your place here. 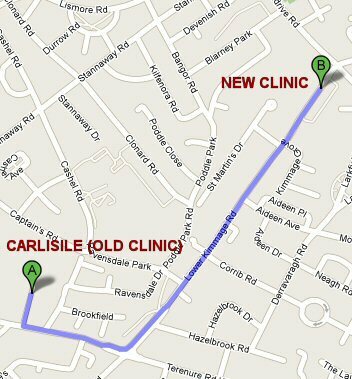 The map above shows how to get to my clinic from my old practice. You are on the Contact Me Page. To Return to the Home Page Click Here.